OTTAWA, Ontario (AP) — Ben Harpur scored his first NHL goal, Craig Anderson stopped 36 shots and the Senators spoiled Erik Karlsson's return to Ottawa by beating the San Jose Sharks 6-2 on Saturday. 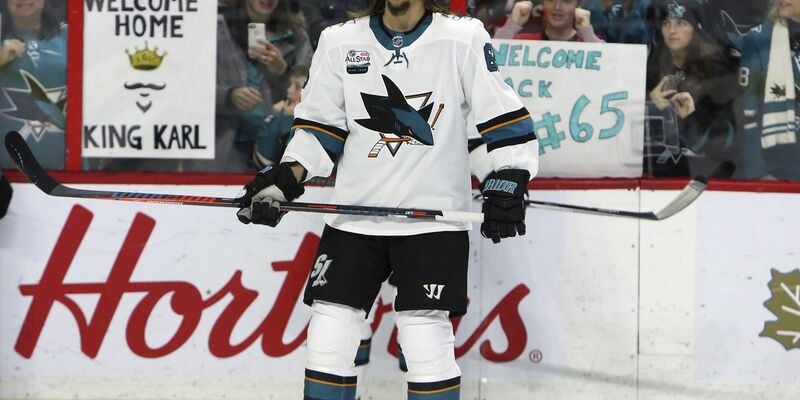 Karlsson, the former Senators captain, was playing his first game in Ottawa since he was traded to San Jose in the offseason. The team honored the two-time Norris Trophy winner with a video tribute during the first period. Ryan Dzingel, Mark Stone, Mikkel Boedker, Magnus Paajarvi and Bobby Ryan also scored as the Senators (12-12-3) won their third straight. Boedker added three assists for a four-point outing. Joe Thornton and Barclay Goodrow scored for the Sharks (12-10-5), who extended their losing streak to a season-high four games. Martin Jones made 21 saves. The Senators took a three-goal lead at 4-1 with Stone's power-play goal four minutes into the third period. And Paajarvi made it 5-1, scoring into an empty net with over five minutes remaining. Ottawa opened the scoring as Dzingel picked up his own rebound and beat Jones from a sharp angle for his 11th of the season. San Jose tied the game with a power-play goal on a play that started with Karlsson and ended with a wide-open Thornton for an easy goal. But the Senators score twice in a span of 49 seconds to take a 3-1 lead. Harpur, playing his 60th game, wristed a shot past Jones and Boedker, a former member of the Sharks, beat the San Jose goalie through the legs.